Oh yeah, I can’t begin to describe how much I like this movie. I’ve seen it before, but I thought I’d run through the entire Halloween series as I try to cram in all types of horror/sci-fi/fantasy films before the day of Halloween. And yeah, it isn’t the greatest sequel, but due mainly to John Carpenter’s and Debra Hill’s script, it does a really great job of taking and expanding the scope of the first film. Basically, the film re-establishes the last five minutes of the first film with some minor revisions and additions. Think back to the beginning of Back to the Future 2 or The Lord of the Rings: The Two Towers, and how cool it was that it did the exact same thing. It immediately replaces us in the thick of the action and re-establishes many of the main characters. Here, Laurie (Jamie Lee Curtis) is rescued by Dr. Loomis (Donald Pleasance) from being killed by Michael Myers. However, just as in the ending of the first film, the body of Michael has disappeared despite being shot! six! times! (as Mr. Pleasance shouts, chewing every word like it was a last meal) and falling of a second floor balcony onto the cold hard ground. And, in an interesting writers’ choice, we end up in Michael’s POV in the moments immediately following this exchange; we abandon our protagonist, Laurie, for pretty much most of the first act. At first I thought this was a mistake, but on reflection, it’s actually a pretty cool idea. What’s cool about this decision is that it allows us to experience the flow of news information that slowly expands outward about the killings and the bodies discovered in the house opposite the Strode abode. We get to see how the information affects the neighborhood and how it spreads. And of course, within this first act, Michael gets to kill again. Another interesting decision made by the writers is the decision to keep Laurie traumatized and on drugs; for a large part of the movie, she is bed-ridden and out of action (similar to Judith O’Dea in Night of the Living Dead). When Michael finally tracks her to the hospital, we understand how extremely vulnerable she is, and yet she still proves very resourceful and capable. The script also establishes a reason as to why Michael has targeted Laurie. It’s a little bit of a soap opera plot involving a hushed up birth and adoption and name change, and yet it remains plausible and acceptable. What doesn’t seem plausible is why Michael waited for as long as he did, and how he found out about his relationship with Laurie. Hmmm. Finally, this film plants the seeds of Samhain and the druish hocus-pocus which, I believe, parts 5 & 6 pick up on. One of the biggest drawbacks of this film is the music; the score suffers from not being performed by John Carpenter and being an 80s synth update rather than the percussive and haunting piano. Also, there is the killing where MM tilts his head sideways, recalling the same movement after he killed P.J. Soles’s boyfriend in the first film; here it is done in close-up and it’s neither effective or creepy. Still, there are a lot of cool things about this movie: the shoes falling of the nurse as MM lifts her off the floor with a scalpel in her back; the very cool background killing of Bud while his girl sits in the foreground; then there’s the bug-nuts slamming of the cop car into the teenager. 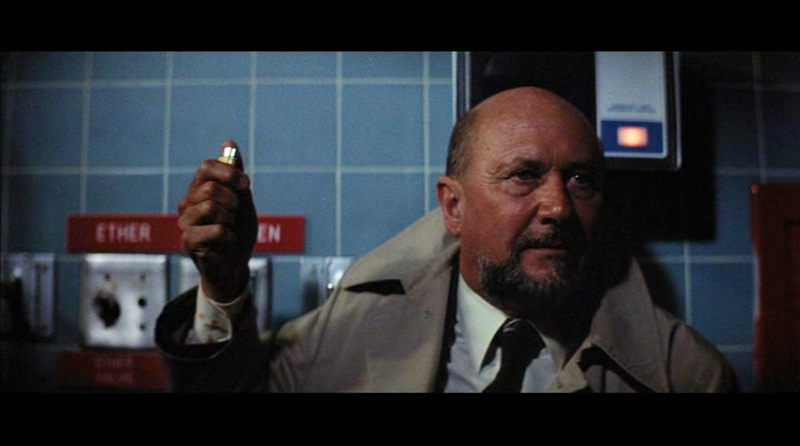 And finally, there is Dr. Loomis’s last line of this film. It would have been the perfect ending for both characters, except Halloween IV happened. In any case, this movie back to back with the first, and classic, film makes for a satisfying duology. I give this film three out of five stars. Once again, I will promise to see The Fabulous Stains. Cross your fingers!